6500 Square foot Luxury Lakefront Estate. Luxury and privacy is a rare combination that this Lakefront Estate provides. Truly a one of a kind Mansion in South Lake Tahoe. Huge Movie Theater with a 180 inch HD Screen and comfortable couches, bean bags and lounge chairs for the ultimate in Movie Theater experience. Large bar area huge Flat Screen TV with bar chairs just outside Movie Theater. Oversized open floor plan great room with top of the line chefs kitchen, bar chairs, dining table, living room with sectional sofa and 75 inch Flat Screen. 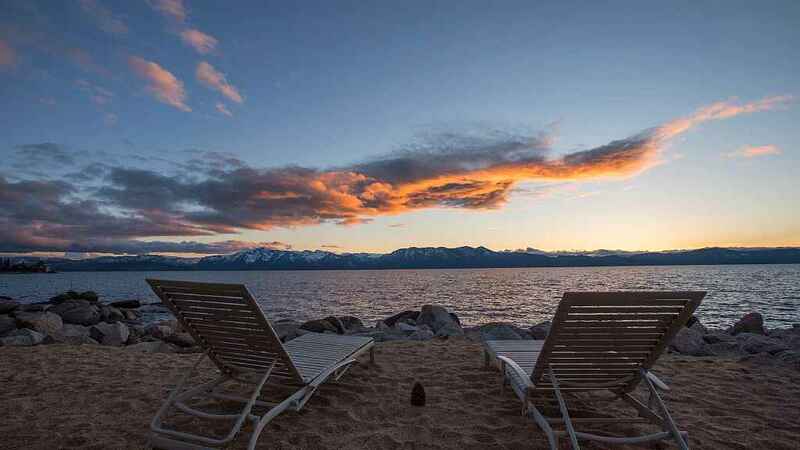 Unbelievable panoramic Lakeviews from every angle, snowcapped mountains across the lake bring the turquoise waters together with the white snowcapped mountains behind them allowing for picturesque views all day long. Guest suite over garage with King bed, full kitchen, full bath. 3 bedrooms on 2nd floor of Main house. Top Floor loft has a Queen bed with office and panoramic lake views from every window. Many decks off each level. Large hot tub off main level with BBQ and patio furniture. Open up all the windows and hear the waves crashing. Elevator access available from garage to Main house. 6th Bedroom is an option as the Movie Theater room has a Murphy Bed that drops down as a Queen bed so you have complete privacy and a Full bath next to it. Bedrooms Bedroom 1 - 1 king , Private Guest suite above garage, detached from Main house.